It’s the first week of the month and you are excited about the pay check you have just received. And then it strikes to you – the burden of all the monthly expenditures that have to be met. Checks are paid. And finally, there isn’t much left. You are overwhelmed as to where the entire salary disappeared. 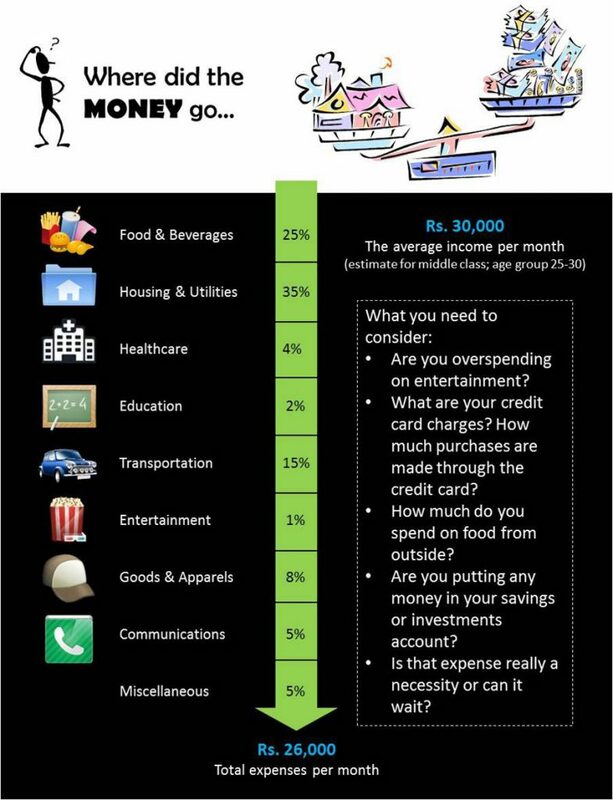 The chart below is an estimate of our monthly spending habits. If you think your savings or the amount invested per month is less, simple money management steps will help you out. Money management is essential to plug the holes in your pocket and retain more of what you earn. A little effort from your side and a few minutes to spare, any individual can start saving more and securing their future financially. Look at the following points and see if you can inculcate some of them in your daily life. Why do you want to invest or save? If you have a clear objective behind investing and saving, the plans will fall in place. Set a goal and track your progress to achieving it. This will make you more finance conscious and you will be motivated to work towards the goal. Create a budget for an entire month. This will contain the list of expenses expected and the maximum amount you are willing to let go for each item. Before listing out the expenses and allocating funds, reduce you’re your income by the amount you wish to save and invest. Now evaluate the entire proposed spending plan and see whether you can cut down on any of components. Use this this budget as a control to avoid overspending in the next month. – Housing and utilities is a major expense. However, for the young, it’s easy to manage housing and utility costs by staying with parents or sharing a room. – Need to buy a pen from the stationary shop on the main road? Walk! It’s good for health too. – Ordering lunch at work every day is a major expense that can be cut down. Try packing your own food from home at least twice a week for a start. It’s more nutritious and cheaper. Gradually reduce the amount spent on food and beverages from outside. – If you have a habit of leaving on electrical switches when not in use, now is the time to stop. The use of credit cards should stop unless it is an emergency. Plastic money has an interest rate that increases your expenses unnecessarily. Clear all debts, first starting with those that have a higher interest rate. Start an emergency fund if you don’t have one yet. Put a certain amount of your savings into this fund every month. You never know what awaits you in the future. These tips should get you started towards being disciplined towards your expenses. If you are disciplined, you can secure yourself financially in the future and avoid overspending. Have more tips? Feel free to comment below. 0 responses on "Where did the money go?"